Now that it is Autumn, everyone around me seems to be going crazy for pumpkins. The notion of pumpkin being used in sweet foods is a novelty for me. It wasn't a vegetable - or squash - that I grew up with. I mean I knew what a pumpkin looked like, I wasn't oblivious about Jack o' Lanterns, but I had no idea it was but one member of a large family. I remember bursting into somewhat unreasonable laughter at the comical butternut squash that was being bought by a supermarket customer at the store I worked at. I really had no idea what it was! Being me, I refused to have anything be alien to me, so I strove to make squashes my friend. Butternut squashes. Not so much pumpkins. Now I work in an international company, and as a nice way to finish the first 'quarter', they celebrated Canadian Thanksgiving that coincided with the time. Pumpkins, pumpkins everywhere! Well, it certainly felt that way. I decided to clamber on to the bandwagon in the misguided belief that I would suddenly appreciate and love pumpkin flavour. 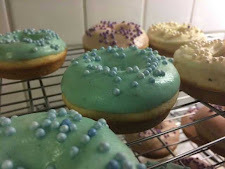 I tried Pumpkin Donuts (please see next post! 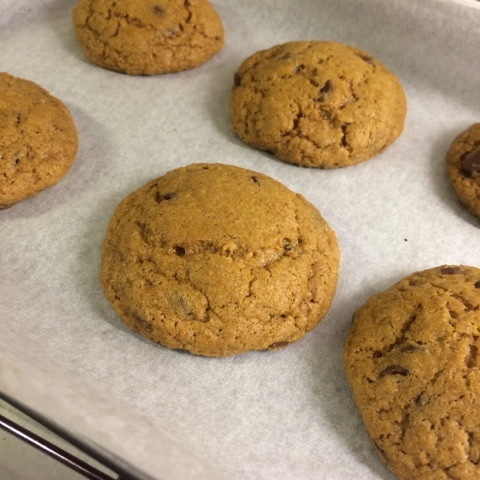 ), and found that this recipe for pumpkin cookies would conveniently use up the rest of the puree I had from my open can. 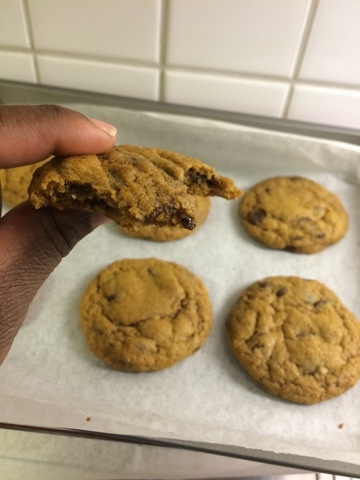 The recipe was straightforward, nothing to complain about, however this is the second time I have tried a cookie recipe from Yammie, and my quantities vary quite widely from hers. I guess my standard cookie size is a bit bigger than hers, and she does tend to vary from type to type, although the ingredient quantities/batter size stay more or less the same. I know I keep making the mistake of trying warm cookies, but I did it again, and found that the taste was not for me. Not the same situation for my colleagues, who really appreciated them.